And with that, another summer weekend has come to an end. Everything seems to be in fast forward. Time stand still. Thankfully, I did accomplish a few things grill worthy. First, I took the time to capture a new "family portrait." I've had several through the years, and as the Weber fleet changes, a new photo is required to mark the occasion. Also, I realized when I took the last shot, I had left out the Q and well, there was a lot of guilt I had to deal with! We've also added some new outdoor seating and more overhead lights. The best part of the lights is I've "connected" them to the home. Thanks to Siri or Alexa and my iDevice outdoor switch, I can switch them on or off from anywhere in the house. When winter rolls around, I'll thank myself! While I spent part of my Saturday photographing cocktails for some future posts, I had a lot of fun just shooting a ribeye. I once read an article somewhere "classifying" different types of food photographers. I forget the other labels, but one stuck out: The National Geographic. In essence, the NatGeo photographer gets down and dirty to get the shot in the moment. This struck me, as I probably approach photographing a ribeye on the grill like a NatGeo photographer approaches a lion on the Serengeti. Sure, there are differences. I'm walking out the back door and not traveling halfway around the world. Also, and most importantly, I'm the one doing the eating when the shoot is over. If you are a fan of avocados, I suggest checking out my latest post on the Weber blog: Grilled Stuffed Avocados. They are easy to grill and even easier to enjoy. As with all things, it's the cheese that makes it. 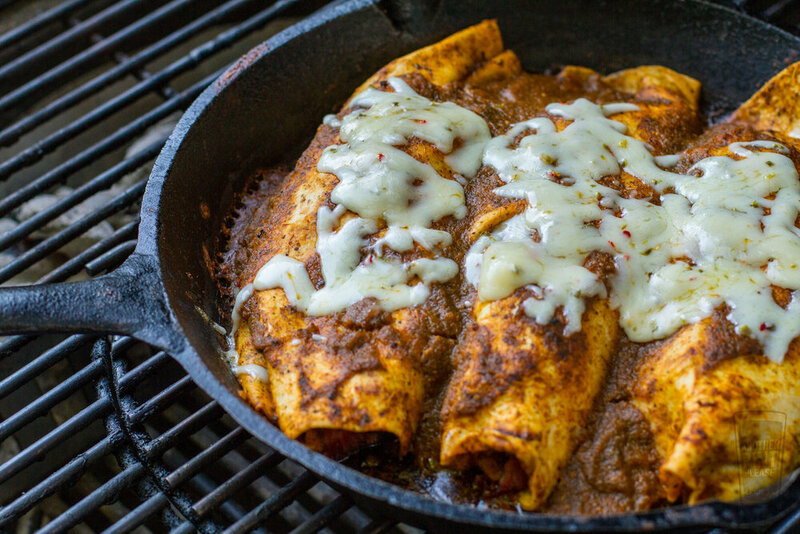 Finally, I recommend grilled enchiladas. While I touch on the story in the post, the details still give me pause. I was at Warped Wing. After just walking in the door, Jorge, the owner of the Escollo brewery and restaurant in Mexico City, Mexico approaches me and wants to know if I have a blog. I didn't know Jorge, but it was obvious, and frankly, surprising, he knew me. Amazingly, Jorge follows me on Instagram. He only realized recently I was in Dayton. Jorge was in Dayton, as he is best friends with John Haggerty, the amazing brewmaster at Warped Wing. John and Jorge met awhile back and have been collaborating ever since. SeñorWITa Mexican Wit, their collaborative beer, is on tap now! So anyways, the enchiladas. As the night went on, I asked Jorge how he made a red enchilada sauce. I was preparing my post. Jorge contacted his chef and through a series of translated text and audio messages, I had my recipe. It was a fantastic chance meeting and the enchiladas live on as a reminder. Our meeting was proof that timing is everything. So yes, time is flying by, but thankfully, the moments that slow down are the absolute best. I'm just glad I'm there with my camera to capture them. It's not everyday you walk into @warpedwing and meet @c_o_y, a friend of #anotherpintplease from Mexico City!